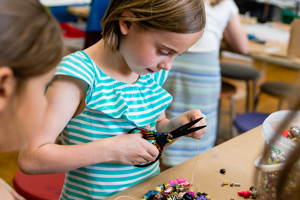 The “Nest” is our program for 5, 6, and 7 year-olds (kindergarten and first grade). Students from two Nest classrooms are together much of the time, and the Nest Teaching Team works with all the students of the Nest, striving to form connections and relationships with every individual and family. The Nest classroom provides a nurturing environment for children to develop at their own pace, socially, emotionally, physically, and academically. 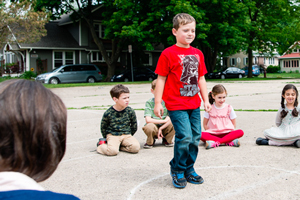 Students have time for structured and unstructured play, both indoors and outdoors, daily. We emphasize the value of community, making friends, restorative conflict resolution, and making choices. Two-year placements provide opportunities for natural leadership growth, greater self-confidence, and deeper relationships. Multiage collaboration with two-year placements provides opportunities for natural leadership growth, greater self-confidence, and deeper relationships with peers and teachers. Students, families, and teachers benefit greatly from the increased knowledge and insights gained through a longer shared experience with each other. Multiage classrooms provide an environment where the talents and needs of individual students are emphasized and a more authentic sense of community is created in the classroom. Age alone does not determine the skill level of a child. Multiage groupings provide a flexible setting that recognizes children’s varied development and learning styles as well as honors the diversity in the group. They are also designed to maximize the potential benefit of interactions and cooperation among children who vary in experience, maturity, and ability. There are frequent opportunities for the development of student leadership as children are encouraged to offer and request support from each other in all aspects of classroom activities. Since students are in a classroom for more than one year, teachers further develop student/ teacher/family relations and gain a better understanding of their students’ long-term development. The Nest language arts program fosters a love of reading, writing, listening, and speaking for pleasure, information, and instruction. These are naturally connected processes and are best learned with an integrated approach. Children value literacy when they can connect it to their daily lives. Children’s motivation in literacy development is enhanced by exposure to a rich variety of materials, experiences, and activities in which language plays a key role. We support the children at each stage of development and scaffold them to the next level. Reading is a developmental activity. We recognize that intellectual maturation, growth, and readiness are naturally uneven processes; children’s development can vary widely and affect their progression in reading. We provide a literacy-rich environment with opportunities to read within a meaningful context, gain an awareness of phonics, and practice oral language and listening skills. We use a process approach to teaching writing. All of the children in our classroom are writers, although the forms of writing they use may vary. Additional writing goals include writing in different genres, cultivating independence, building stamina, and utilizing resources. As long as children are surrounded by print, authentic literature, and have daily opportunities for reading and writing, with adult support, they will move toward sound spelling and conventional writing when they are ready. To explore this domain further, visit our Curriculum Matrix. Mathematical investigations are an integral part of the daily life in the classroom. Actively thinking, constructing, and communicating mathematical ideas and concepts is emphasized throughout the school day. From calendar work and counting the days of school during morning meeting, to hands-on manipulative exploration and problem-solving during math workshop, students are engaged in building their own mathematical understanding. There is opportunity for deep exploration. Students are given the time and space needed to process concepts and ideas. The emphasis of all of our math work is for students to construct their own knowledge and solve problems in ways that make sense to them. Every science inquiry starts with noticing, wondering, and exploring. Much of children’s natural curiosity and wonder is driven through their play. Ample opportunities for free exploration and discovery give time and space for questions to develop. After making observations, children ask questions to find out more information. In turn, their questions inspire investigations during which children engage in more focused explorations. The explorations are drawn from life, physical, and earth/space sciences in ways that are meaningful to children based on experiences in their daily lives. These inquiries are built around important science ideas, which are developmentally appropriate and accessible to children’s direct exploration. 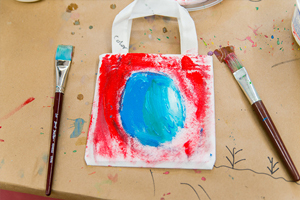 They include phenomena/events that children can dive into deeply and over time and are engaging, challenging, and fun. Providing guiding questions at critical times help provide a connection between a child’s background knowledge and new experiences. Students in the Nest are still in an inward-focused, egocentric developmental stage. Through a purposeful social curriculum, as children this age develop a strong sense of self, they can begin to develop empathy for others and understand the broader world. Studying themselves and their families provides a foundation from which to learn about other families and their cultures, histories, and traditions. Learning to understand and respect one another’s perspectives, differing ideas, and opinions is an integral part of being a citizen in a community. Our classroom community functions as a developmentally appropriate representation of the wider community. For example, student voice, choice, and participation are an important facet in the structure of our classroom, just as voting and community action play important roles in our democratic society. Within this community, students are able to practice the principles of civic life. Although there are many differing opinions and perspectives, we emphasize the role of a community member is to work for the common good. Our Social Justice curriculum is grounded in the everyday life of our classroom and school community, gradually expanding to include the wider community around us. At this age, children move through the developmental continuum of parallel play to working with others. During this important transition, students need scaffolding to help develop empathy, broaden their worldview, learn conflict resolution skills, and encourage them to become advocates for themselves and others. Children learn the power of their own voice and how to use it. We foster critical thinking skills through discussion, activities, literature, and real-life experiences. Together, we examine dominant culture with a critical eye, modeling ways to identify bias, question injustice, and, when appropriate, take action. Every child begins life with a passion for creating and a thirst for knowledge. Children’s innate curiosity is something to nourish, encourage and grow. Nurturing a child’s approach to the world results in a self-motivated learner who seeks increasing opportunities to grow and express their capacity. A student like that knows no limits! Within each art experience, students’ freedom to choose a subject or material allows self discovery and opportunity to problem solve. A wide range of media and concepts, including composition, balance, contrast, repetition, emphasis and storytelling come together to form the students’ art foundation. Group work encourages cooperation, compromise, inspiration and problem-solving among students. Students begin to develop their voice and style as an artist, supported by classroom discussion. 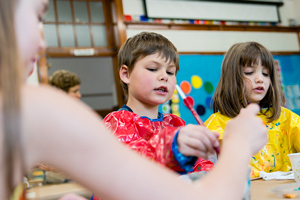 Integrating with classroom curriculum, the working art studio is an excellent place to teach and practice social justice skills for young students. 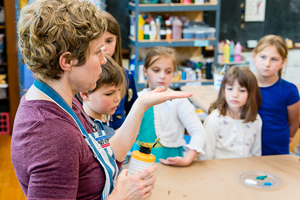 Art is explored as a window into history and culture, and by combining the practice of art with exposure to art from around the world, students gain a deeper understanding of what art is as well as an appreciation of the cultures that created it. Nest students engage with music through song, play, composition, improvisation, performance, movement, recording, and listening. 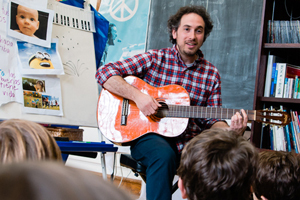 These experiences nurture students’ listening and collaboration habits, encourage their creativity and confidence, and support them as they build developmentally-appropriate musical skills. 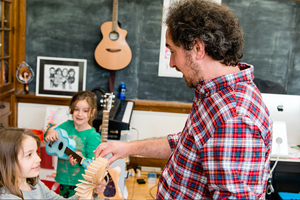 The Nest music curriculum is centered around the children’s own creations. 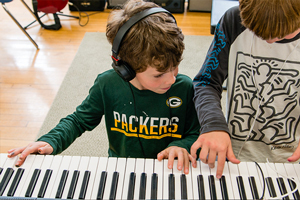 As they compose original music – from percussive improvisations to written scores with invented or traditional notation systems – the Nesters learn key musical concepts such as pitch, timbre, form, dynamics, and rhythm in an active, hands-on way. 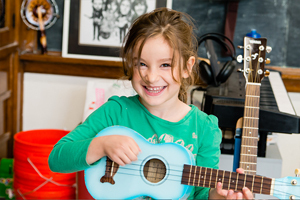 We celebrate music as a creative art form, a joyful part of everyday life for people everywhere, an integral part of our identity as individuals in a diverse community, and a treasure of exciting skills and ideas for each child to explore. 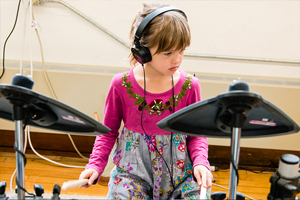 Instruments available for the students include pianos, keyboards, recorders, guitars, ukuleles, lap-harps, computers with recording and notation software, pitched and non-pitched percussion, electronic drum set, and more. In the Nest, the Physical Education curriculum balances sports related skills, cooperative play, and teamwork. Teaching friendly and inclusive game play and movement plants the seeds for lifetime love of physical activity. Individual physical development and progress is equally as important as effort, interest, and participation. 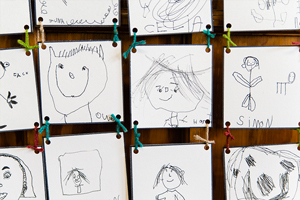 We invite students to contribute their ideas to the curriculum and play. Student voice is an important component of the activities we choose and the guidelines or rules of the game. Integration with classroom thematic units and other all-school programming happens as often as possible. We introduce exercise, sports and healthy competition in an atmosphere of inclusion and shared celebration of our abilities and accomplishments. 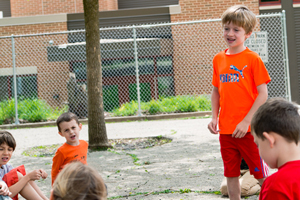 Through a wide variety of activities and learning goals students develop the foundation and tools necessary to develop a physically active and healthy lifestyle. 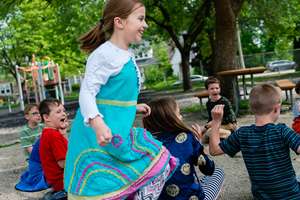 Students are able to have fun while learning to respect one another, challenging themselves and setting personal goals. 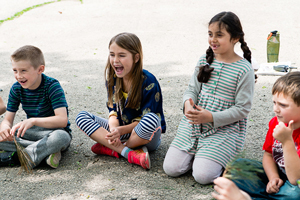 Nest Spanish brings together the dynamics of progressive education – valuing interaction, movement, curiosity and play—with fundamental concepts of language acquisition such as exposure to vocabulary in context and physical response to language. Students are exposed to large amounts of rich comprehensible input in Spanish—spoken language made accessible by careful word choice, repetition, gestures, and visuals—so that they can begin forming an ear for the language. The language ear is an intuitive understanding of inherent patterns, sounds and procedures in a language, an invaluable base for all further study. A casual, playful atmosphere is established to lower the affective filter, the inhibitions and fear of failure that obstruct language learning. Students are not pressured to produce flawless Spanish, but are instead free to develop a natural curiosity and desire to learn new words. Reading and writing support is available but students are not rushed in these areas. Social justice concepts guide Nest Spanish work in multiple ways. Nest students are regularly exposed to other cultures, their traditions and ways of life through books, music, videos and artifacts. They are encouraged to practice demonstrating interest, respect, and an open mind while exploring these cultures and comparing them to their own. They also learn about historical and contemporary figures such as Cesar Chavez who worked to stop unfairness and make a difference. The classroom community embodies social justice as all members treat one another with fairness and support one another in “giving it a try,” and celebrating each other’s successes. Nesters learn the fundamentals of hardware and software through exploration and investigation. Students will navigate both computer and internet browser interfaces with different operating systems. By utilizing kid-safe websites related to their classroom unit, Nest students familiarize themselves with mouse to screen coordination while learning integrated material. Through games and play, students become fluent with computer functions. Nest students also learn shortcuts and gestures with touchscreens and how to troubleshoot. While using tablets as cameras and video recorders, students discuss and evaluate when and how it is acceptable to record other people. They are introduced to the idea of being a digital citizen, making safe choices, limiting screen time, and what to do if you feel unsure. Cultivating a love of words, stories, and reading is a foundational skill for our youngest students. By reading to students and discussing ideas from a wide range of texts (picture books, biographies, folklore and mythology, poetry, beginning readers, and non-fiction), they learn to become great storytellers as well as keen listeners. Books are social justice tools and help teach about identity, diversity, and equity; they can act as both mirrors in which students see themselves and as a windows in which students observe, learn from, and empathize with others’ experiences. Our Nest students come to Wingra with a range of literacy experiences. We use writing, drawing, painting, and drama to give students opportunities to express their thoughts and feelings about a story or poem. Students in the Nest create collaborative books in the library on a variety of themes and practice their oral, visual, and written storytelling skills. Students at the Nest level have lots of questions about how the world works and are learning ways to get some of their questions answered. An in-depth look at curricular approaches and developmental considerations in the Nest including schedule, programming, and terms. Originally from Peoria, Illinois, Debbie has worked with children in different capacities for many years. She is honored to work and learn in a school that offers an education that truly prepares children for life as adults—to be community-minded, collaborative, and curious. She worked as a waterfront director at a sleep-away summer camp in Waupaca, Wisconsin where she was able to teach children of all ages how to swim, boat, and water ski. While working on her Masters Degree in health education, she worked in a more traditional environment as Teacher’s Assistant for special education at the high school level on Long Island. After receiving her M.S., she taught kindergarten at a private progressive school in New York City for two years. Debbie moved to Madison with her husband in the summer of 2007. She is very proud to be part of the Wingra community as a classroom teacher. During her time teaching at Wingra, Debbie also completed a teaching certification program through UW Oshkosh in Early Childhood and Middle Childhood. Debbie’s hobbies are running and participating in triathlons, spending time family, and being active together. Kim first joined the Wingra staff in 1986. Kim took a temporary Wingra leave to start a family and returned to Wingra in 1989, teaching 5–7 year olds, and she has been there ever since. In addition to receiving her master’s degree in literary studies in 2006, she has also taken classes in phonics-based instruction such as Orton-Gillingham, Project Read, and Direct Instruction and has used these methods to tutor students privately. Kim enjoys nature and has taken classes to help bring nature studies into the Nest curriculum. Kim has two children, both Wingra alumni. Her daughter graduated from St. Olaf College and works at a non-profit in Minneapolis. Her son graduated from Wesleyan University and works in the Extended Day Program at Wingra School. Colleen grew up in the north woods, battling mosquitoes and snowdrifts in Rhinelander, Wisconsin. 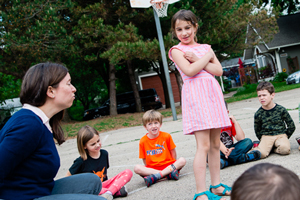 After college in La Crosse, she taught 8- to 10-year-olds in Edgerton, Wisconsin. In Edgerton, she taught in a double room with a master educator as her mentor and friend. She earned her Masters in Education from the University of La Crosse during this time. When it was time to make the move to Madison, Wingra was the only place Colleen wanted to be because the philosophy of the school so closely matched her own. Colleen has taught in several classrooms while at Wingra, including P.E. and the Pond (ages 7 to 9). She’s taught in the Nest since 2014.